The Kepler spacecraft will observe the same patch of sky for years in an effort to discover planets by the slight dimming as they pass in front of their parent stars. Having been launched in March last year, it confirmed its ability to detect planets by detecting a known planet a few months later. Now it has been announced that Kepler has discovered five new planets. They are all large planets, one about the size of Neptune and the others larger than Jupiter, that orbit very close to their parent stars with orbital periods of only a few days and are extremely hot, with surface temperatures ranging from 1200 to 1600 degrees Celsius. Since they orbit around their parent stars so quickly, Kepler was able to observe the dimming of the light from the stars enough times that it can be confirmed that they are indeed planets. Discovering planets that are more like our own Earth, with much longer orbital periods that last months or years, is going to take many more years of observations. There also seems to be an odd rumor about the observation of planet-like objects being hotter than their parent stars. If they were planets, then this shouldn't be possible. Another possibility is that they are white dwarfs, except they appear to be too big to be white dwarfs, either. If this rumor happens to be true and not some sort of miscommunication, then it looks like we are going to learn something very surprising about white dwarfs or discover an entirely new type of cosmic object out there. It is still more than a year before the MESSENGER spacecraft goes into orbit around Mercury. 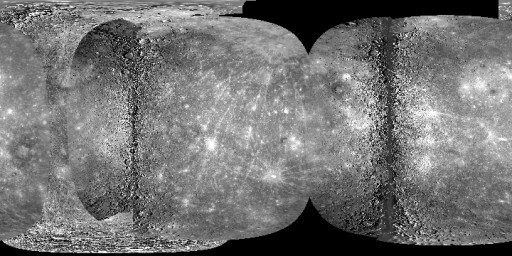 But along with images taken by Mariner 10 more than thirty years ago that observed less than half of Mercury's surface, images taken during the three flybys of MESSENGER were enough for nearly complete spacecraft images of the planet's surface. For the first time, we have a nearly complete global map of the surface of Mercury taken in visible light. That would be cool enough: the map is also going to be useful when MESSENGER goes into orbit around Mercury, which is when it can really start studying the planet. By the way, I can't help but be drawn by the dark band that seems to span the whole planet in the north-south direction. Anyone know what it is? LCROSS crashed into the Moon last month, although the lack of a visible plume in the real-time video feed made the impact less exciting than it could have been. But the lack of a visible plume is hardly a failure, since LCROSS was sent to do science, not make a flashy impact. And it looks like LCROSS has managed to find exactly what it was sent to find on the Moon. Analysis of the near-infrared and ultraviolet spectra as LCROSS passed through the plume kicked up by the impact of the Centaur rocket upper stage indicates that the plume contained water. And not the piddling amount of water that seems ubiquitously present on the rest of the Moon: there must be significant reservoirs of water at Cabeus crater. Just how much water there might be remains to be seen, as well as the identity of other compounds that appear to have been detected in the impact plume. IBEX, the Interstellar Boundary Explorer, studies the boundary between the heliosphere and the interstellar medium by observing energetic neutral atoms created as the solar wind hits interstellar gas. They have just released the first scientific results and associated sky maps from the data collected by IBEX. There's a surprise within the results: IBEX observed a ribbon around the heliosphere that is a dense source of energetic neutral atoms, something that was completely unpredicted by any of the theoretical models. There also seems to be fine structure within the ribbon, something else completely unpredicted and suggesting something weird is going on in the boundary between the heliosphere and the interstellar medium. 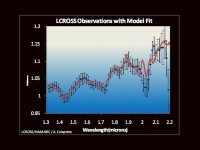 Continue reading "First sky maps from IBEX"